Body in the library – a murder mystery of our own! Last term the Library Team at Joeys excelled themselves in launching an amazing “Body in the Library” investigative program in collaboration with the Science and English faculties. I promised to share this after talking about it at EduBloggerCon 2010 in Denver. So here are some more of the details! Boy’s body found in the Resource Centre! Year 8 suspected! The focus of the project was to facilitate deeper learning in our students by creating an ‘authentic learning’ experience to strengthen writing and literacy skills across the curriculum. In English, students learned about the literary conventions of forensic fiction in their crime novel, Framed, and how to use them to solve a crime. In Science, students learned about how use a variety of scientific methods including analysing dental records, fragments and fibres, fingerprinting, shoeprinting and DNA samples in order to solve a crime. These skills were then put to the test when boys were asked to solve a ‘body in the library’ type crime which the library team spent weeks preparing! To solve the crime, students viewed the crime scene, looked at photographic evidence, read various ‘official’ forensic and crime reports, watched video-taped evidence of the crime in action; watched interviews of the suspects; read testimonies of different suspects; and analysed many forms of written and physical evidence! Students employed deductive thinking skills, analysed all available evidence and established motives for the suspects in an attempt to determine who committed the crime. Lastly, each student submitted their own police report on the crime and its investigation. This collaborative activity raised an astounding level of interest from all 150 boys – as well as raising a lot of interest from boys from many other years. 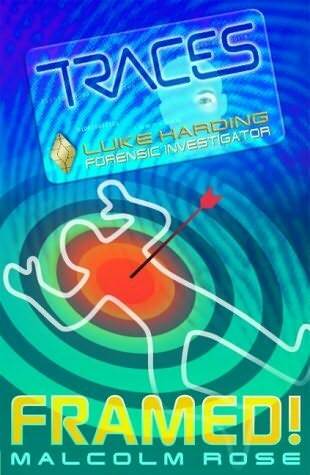 A body is found in the library at the end of Period 4 on Tuesday. It is a Year 9 boy who has been hit on the head with a blunt instrument. The body is discovered by Mrs O’Connell in the Fiction area. 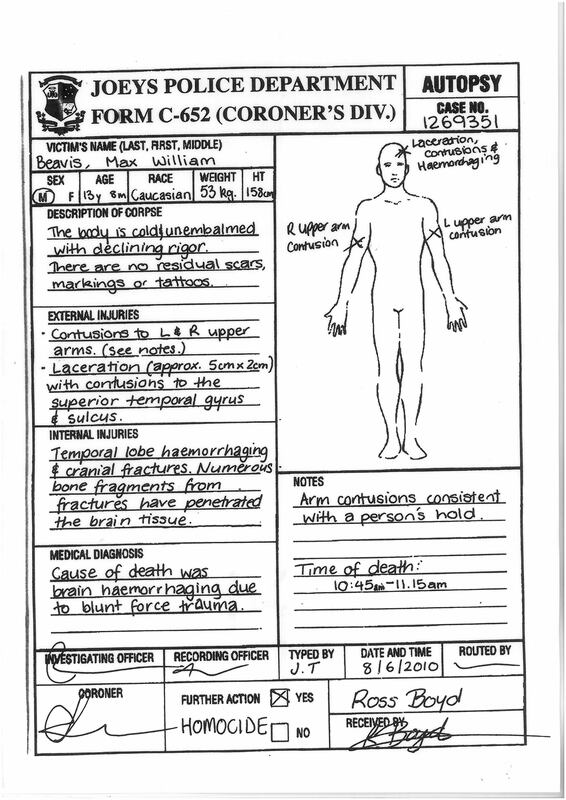 A coroner’s report puts time of death at recess/Period 3. The murderer is Mrs Smith. In a fit of rage, she has killed the student for not returning an overdue book. There are two other prime suspects: Mr Smith, the Yr 9 Co-ordinator, who is annoyed by the behaviour of the student, and Jack, the boy’s friend, who had a fight with the victim. Each boy received a forensic workbook – containing a range of materials for examination such as crime reports, witness statements and a coroners report. In addition the ‘crime scene’ was taped off, with key evidence on display e.g. fingerprints, the location of the body, and places where DNA was found. Photographic evidence included the injury reports (fake bruising and blood on the victim), video footage of the scene of the crime (staged by students and teachers) and also hard hitting interviews. The students were able to go into our two discussion rooms (which have a plasma screen for collaborative work) and view the footage and interviews, and take notes about what they saw and heard. All this analysis led to some fierce competition to solve the crime, and find the murder weapon – which was hidden amongst the library shelves. You guessed it – a steel bookend (decorated with some fake blood). If you want to prepare a scenario of your own, here is our YEAR_8_FORENSIC_SCIENCE framework that set up the string of evidence and clues for our project. A copy of the coronor’s report below will give you an idea of the level of detailed evidence provided for the students to analyse. The rest you’ll have to create for yourself! Did I mention I have the best Library Team on the planet? This was just such a fantastic experience! This entry was posted in Collaboration, Information Literacy, Reading & Literacy and tagged forensic science, Framed, Malcolm Rose by Judy O'Connell. Bookmark the permalink. That’s a marvelous idea! Around these parts, school libraries are being shut down in droves, so it’s really heartening to see how yours is still a valued, integral part of the school. It’s great how multiple departments worked together to create an event every student could enjoy. Wonderful way to embed in learning across the curriculum. The only possible suggestion…rather than murder by the Librarian (a negative connotation that feeds into the OC stereotype) what about having them expire in the stacks, from dehydration because of lack of their information literacy skills? ie wandering the shelves v search online etc. (It was well received at college level back in ’01 when we ran a “Survivor” themed library orientation.) In this day & age they could even expire at a computer – again because of lack of research skills. And wouldn’t we all want to murder people in our own libraries? Awesome awesome awesome!! Thank you so much for sharing such a fabulous task! What a good and ambitious idea. Plaudits to those who thought it up and worked so hard to enhance the learning here.